Hey all....looking for a 5" freeride frame....something along the lines of the Transition Preston. 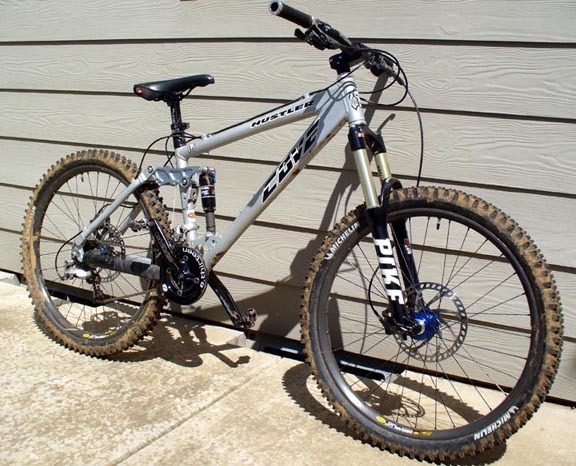 I'm not looking for anything over 5.5....My current bike, which I'm selling, is a 6" but built more to DH. It's just too heavy for light freeriding. So I'm breaking down and buying an actual DH frame...but that leaves a gap for the riding I do most. I don't get crazy and would like something that climbs OK. I live in AZ and most of my riding involves some sort of pedaling uphill. I'm tired of carrying a 45 lbs bike because it's just too heavy to climb...yes, I could just get my arse more in shape but that's too hard! I prefer smaller companies, like Transition or Versus but I'm not aware of that many frames that are in the 4.5'-5.5' range that are designed to handle more than 3' drops. I understand most people have great things to say about Transition and I guess they're high on my list. I'm just wondering what else is out there. Again, I wll not be hitting 20' gaps or anything like that....I prefer smaller, rider owner companies....I'm average size/weight (5'11" 170lbs) and have no problem building a frame from scratch. 3 fts. drops, small companys and 5"travel, under 45lbs. for a 170lbs. mellow rider. the preston defintly sounds like it will work for you....depending on what kind of set up you have now. How about a Transition Preston? The '05 Versus Blitz is adjustable 4-5-6 inches rear travel. Adrenaline has them on sale now also. I already have a HT. I am looking for specifically the 4.5 - 5.5". It's just my personal preference. Dogonfr, I am selling my 05 Blitz. my vote is for a Ventana X-5. It will do everything you need it to do and it turns heads. You will not find a better made frame in my opinion. If you need more info on it check out the Ventana forum. Everyone on that forum will help you out. I just got through with some interesting exchanges over on the General forum about hardtail and full suspension issues. The funniest thing I notice about many hardtail riders is how zealous some of them are about discussions of hardtails vs. fullies. Some of them are downright "religious" in their ferver. As the discussion progressed, some of these single speed rigid guys started coming out of the woodwork touting the superiority of that type of setup as it compares to fullies. Don't get me wrong. I understand, mainly from many on this board, how some hardtails are excellent choices for the dirt jumping and similar activities often displayed here. And I agree that for smoother trails that don't have any appreciable technical features, a hardtail can work really well and often be faster than a fully. But I had a couple of folks argue that I was promoting a "misconception" when I said that a good fully was superior in overall performance to a hardtail once a trail turned nasty and technical. I didn't just fall off a turnip truck from Hicksville, and I realize that a good rider can negotiate a hardtail just about anywhere and get the job done. But do any of you guys on this forum really believe that the same level of rider couldn't go faster and do it easier on a good fully in technical, challenging terrain? Most of us on this forum appreciate full suspension bikes because we ride them in ways and in places that bring out what's good about having the rear wheel move up and down...and we usually like that movement to be pretty big...as in long travel. I'm not talking about short travel vs. long travel, heavy vs. light, but am talking about hardtails vs. fullies in technical terrain with rocks, ledges, and such. There seems to be an emotional fascination by some over these hardtails. Believe me, I would love to be able to justify a good hardtail over a fully for technical, aggressive trail riding. It would be cheaper and simpler, but as long as there is a mechanical advantage to be had by a fully, why would I go there? Now, on the other hand, I do understand why some riders like the challenge of riding a hardtail...or a single speed...or a rigid. It provides something different and fun for some riders...nothing wrong with that. But to state that fullies do not present an advantage in rough, technical terrain is kind of illogical to me. Am I wrong here? What's your take? If you hadn't said small company, I was gonna say Kona Coiler.. I didn't mean to start a HT/FS debate. I understand the differences and really understand that it mainly boils down to preference. I already own a HT and that's not what I'm looking for. I was hoping to tap into the knowledge pool of the forum users to find out what choices I have for the 4.5" - 5.5" FS freeride frames available. I know about the Preston and if I can't find anything better in that category, I'm sure that will be my choice. I owned an '05 Blitz and absolutely loved it. However, I don't want to build another especially since (the frame) would cost me almost the same amount as it did over a year ago...(similar setup is $850) and a Blitz II is just not what I'm looking for. Thanks for the Ventana suggestion and I look forward to hearing of some others. The HT vs. FS debate is an interesting one. Of course each has its own specific advantages and disadvantages. But what about those out there that have and ride both? I myself have a full blown Demo-9 set up for DH, a Dirtbag set up for FR and a Vagrant set up as my FR HT. I can swap out one for another for what ever ride I want to do, but each one has advantages. Most often I will ride the HT early in the week and progress to the fully for more demanding rides on the weekend. I like to hit a new trail or drop with the HT then go back another day and see how much better/faster I can hit it with the FS. I can go faster and maneuver the HT better but can't hit as big a drop without feeling the impact. Now I ride about 95% of the drops on my HT that I do on my FS. Of course I do feel it the next day. before you get your hopes up too high on the Preston, I'm 99% sure that Transition is sold out of them right now so you may have to hunt for one. For 5 odd inches of travel though, you probably ought to look at the Bottlerocket, should be out within a month. 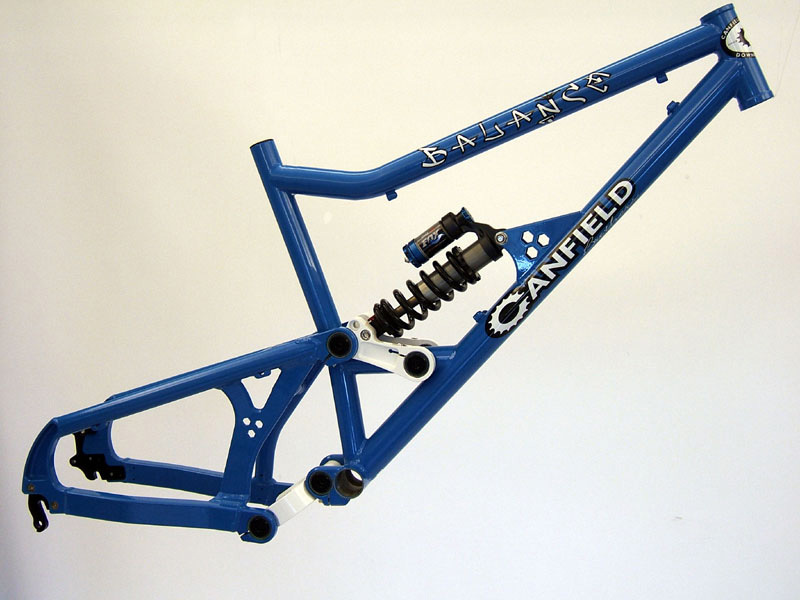 Looks to be a super sweet frame. Never been on one but the Sinister MX looks pretty cool. Also, i think the guys at dropnzone might have a Preston lying around. I second that. Possibly the most do it all bike out today. Less weight than the Preston too and very strong. I am a lot bigger than you (235+ lb) and it has really been an awesome frame and ride both up and down. hah, and NEMESIS Project Cycles has something coming out. what is the running joke around 3 footers? If you actually read my original, unedited post, I said to handle more than 3'. Dude, a 3 footer is nothing at ALL on a hardtail. This one may not be as freeride-esk as you are looking for but is a great 5.5" travel bike with the geo being more slack than other bikes in its category! Cove hustler (I am the same size as you and a medium (17.5) is a killer fit! Turner 5-pack(modified rfx),Cannondale Prophet mx,Mtn Cycle Fury.Afew more. Steel is awsome, just looks skinny. Send them a email or call. please no one hurt me for this,ive oposted it before--the gary fisher fat possum would be good for what you want i think.ive been looking at them more,they pedal great for a single pivot. and they look to be pretty strong.my grad money may go towards one...or a bottlerocket. The Bottle Rocket doesn't look like it has enough seat post extension for climbing. Banshee Chaparral. (The older version is adjustable between 5" and 6". LOL!...actually I think you'd have to refer to him as a skinny possum. Anyway, I think that Possum looks pretty cool for a burly trail bike. I also rode with a guy at Moab on who was riding a Kingfisher, and he hammered that thing mercilessly...and had been doing so for a long time. I'd consider a Possum for what the OP is wanting to do. Yeah, I guess it can't handle those 3' drops. Yeah, I would contact Canfield....I do know that Lance checks the forums so maybe make a post about it in the custom ofr other DH/FR forums....but I think it will be soon from what I have been reading..I just dont think they have updated their site. The preston looks pretty pimp. If your in AZ go see Fish at Cactus Bike. They got a few Preston, dirtbag, and grand mal frames in stock and will hook you up. I'm waiting for the bottlerocket to come out. Give them a call 940-Ride, there right near South Mountain's Pima Canyon trailhead. get a stank stank 05 (stinky) cuase theyre pretty light and have like 6.5 inches or somehting like that. 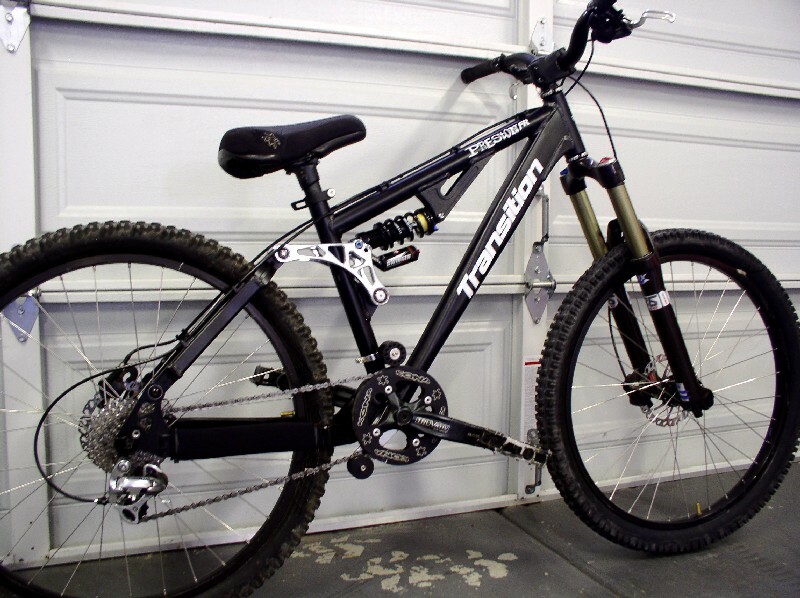 and its freakin cheap chekc this nucka out http://wheelworld.com/itemdetails.cfm?ID=3450 or chekc out the frame for only 599 and use the parts from ur other bike to build her up. One thing to remember to check out is the weight of the frames. You did mention that you wanted a lighter bike that will climb but yet still do some freeriding. I like the Ventana X5 and the Turner 5 Pack being mentioned here. Either frame will cost more than the others but in return you get a west coast locally made frame with great if not the best customer service in the industry. Another nice feature is you can swap rockers and shocks around (depending of frame) to change the personality of the bike. Do a search for Mr Tiles on the Turner boards, he has a new RFX, installed the 5" rockers and a DHX-Air shock with a Pike fork. Couldnt be happier. Dirt jumps the bike plus trail rides it. Searching the Ventana forums for X5 or X6 will get you lots of cool pic's and ride reviews from the guy's from England ripping, jumping, dropping and trailriding as on the X frames. If the price is to high then I would really look at the Heckler, and I like booner's bike as well. The Pike is a great fork for any of these frames. Thanks drumstix....you understand exactly what I'm looking for...and I'm not too worried about price. I'm assuming the frame will be in the $1000-$1800 range anyway. I will look into Ventana and Turner. I know a guy in IL that swears by Turner...uses an RFX for everything, including DH. I have to admit, so far I'm enticed by that Canfield Bros Balance. I guess I need to find out what the weight is on it and what the all alum version will end up looking like....as dogonfr mentioned, it looks a bit "skinny" so I assume the alum ver (front) would be beefed up a bit. I'm not really interested in a SC or Kona...or anything above 6" (or a HT either) and definitely nothing used. 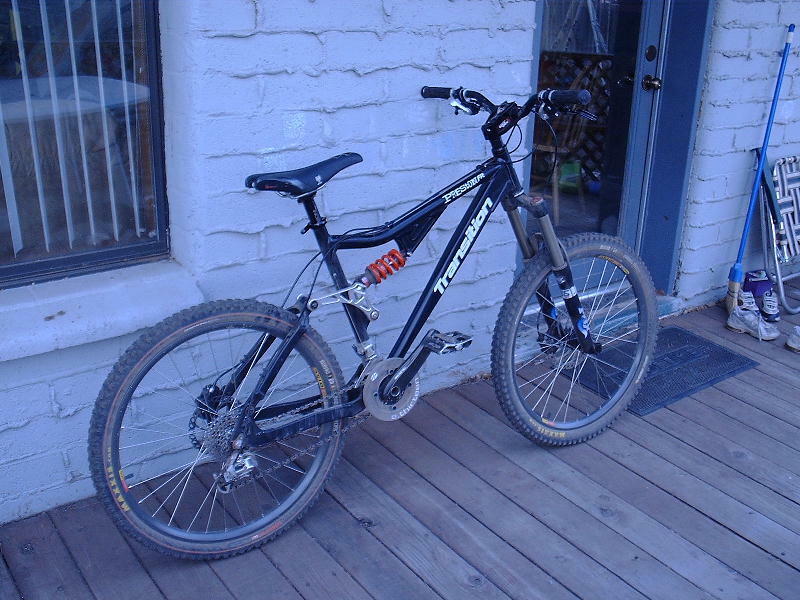 The steel version is in the 11 pound range, Lance said it is built like a mini DH bike...very strong...but not light. I don't know much about the Alum version....they would know best. As well the Sinister is no longer made....FTW is going to be releasing a new bike that he says will rock our world....revolutionize bikes as we know it. I have talked to a few people that have either seen or ridden them...and they rave...so lets see if the hype is true (I cant wait). dude, he said specilized SX, not SX trail. I have seen it , the way he talks about it, get ready for something big. The aluminum Balance will be in the 9 pound range. Should be available in less than a month. It will look almost identical to the steel version, just beefed up a bit. my 05 kona dawg is 5" travel and i drop of 6 footers all the time. I went to the doctor and told him "hey doc, it hurts when I go like this" and the doc said "Does the rear feel too soft?" I've got a Splinter MX and it is unbelieveable! I'm still dialing it in, but it has already made a huge difference in my confidence level. 5" or 6" of superbly engineered travel, fully adjustable geometry (set super slack in these photos), 12mm thru axel, pedals a lot beter thatn it should (it is a single pivot bike, but does not bounce around when pedaling), really fast. Actually for the riding the OP is looking at doing, a Splinter ER might be a better call - 4" or 5" of travel, lighter, a bit steeper, still pretty damn strong. Set it up with a coil shock and you are set. The Splinter in general is going to allow for a wide range of geometry adjustments since it is not just a matter of fastening the shock to one hole or another. Everything is adjusted by a pull rod that is super easy to use. The only problem is that the Splinter is not being made this year (I got the last one.) Used ones are still around, though. HOWEVER if you can wait until the fall, there is a new one coming out that will blow your mind! I've only given a quick parking lot test to the prototype, but it is off the charts. I have no idea how it works, but it sure does work! If you are already acustomed to a suspended bike, I 'd suggest you wait to see what is coming from FTW and his crew. Last edited by Techfreak; 06-20-2006 at 08:49 AM.